In line with Phase 3 specification reform, we are developing a new A-level Environmental Science qualification for first teaching in 2017. This specification is being developed to enhance the new suite of AQA A-level Sciences. The content will be updated and refreshed from the A-level Environmental Studies specification to reflect the current focus on the sustainability of our planet. Both AS and A-level qualifications will be available. The AS will be for first certification in 2018 and the A-level for first certification in 2019. A-level Environmental Studies 2440 gives students in-depth knowledge of, and informed insight into the environment and the processes that control and affect it. Environmental Studies is a worthwhile choice for students who are particularly interested in studying Biology, Geography and Environmental Science or who are considering a career in ecology, countryside management, wildlife conservation, marine biology and planning. There are four units in the specification – two at AS Level and two at A2. All the units are assessed by written exam. A-level Environmental Studies builds on knowledge gained in GCSE Science subjects or Environmental Science. 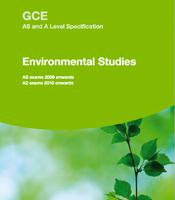 Students who have studied these subjects at GCSE will be well placed to study A-level Environmental Studies.